Jack is joined on stage by Chade-Meng Tan for an exploration of how spiritual practice and the search inside ourselves can guide us through our human predicament. Chade-Meng Tan (Meng) is an award-winning engineer, international bestselling author, thought leader, movie producer, and philanthropist. Meng led the creation of a groundbreaking mindfulness-based emotional intelligence course at Google called Search Inside Yourself and is work has received eight nominations for the Nobel Peace Prize. Sylvia Boorstein, MSW, Ph.D. is the author of numerous books on Buddhist philosophy and meditation practice, including That’s Funny, You Don’t Look Buddhist and Happiness Is an Inside Job: Practicing for a Joyful Life. She is a founding teacher of Spirit Rock Meditation Center in Woodacre, California. Sylvia has been teaching nationally and internationally since 1985. Her personal emphasis in teaching is the integration of mindfulness into everyday life. Jack shares the story of the Buddha’s final days and teachings, a story of inspiration and wisdom that offers a bigger picture of our place in things. Jack Kornfield explores the liberation available when we cultivate our creativity through the practices of an open heart. This week on the Heart Wisdom Podcast, Jack introduces us to a particularly beautiful practice, known as the Big Sky Meditation, that guides us into a quality of presence that is entered through the doorway of sound. On this special episode of the Heart Wisdom Podcast, Jack reflects on the life and teachings of his teacher Ajahn Chah. This week Jack begins a multi-part series that explores the essence of Buddhist psychology. Jack’s teaching looks at how Buddhist psychology can help us live amidst the reality of impermanence by cultivating inner peace and equanimity. This week, Jack examines the quality of resolve and dedication known as adhitthāna, one of the ten pāramitās in the Buddhist tradition. Ep. 67 - Who Am I? Live from the Spring Insight Meditation Retreat at Spirit Rock, Jack gives us practices to walk our own Bodhisattva path. A Bodhisattva is one who has tread the path to freedom laid out by the Buddha and dedicates their life to sharing that with the world. On this episode of Heart Wisdom, Jack shows us ways to find the Bodhisattva within us all and the gateway to liberation. 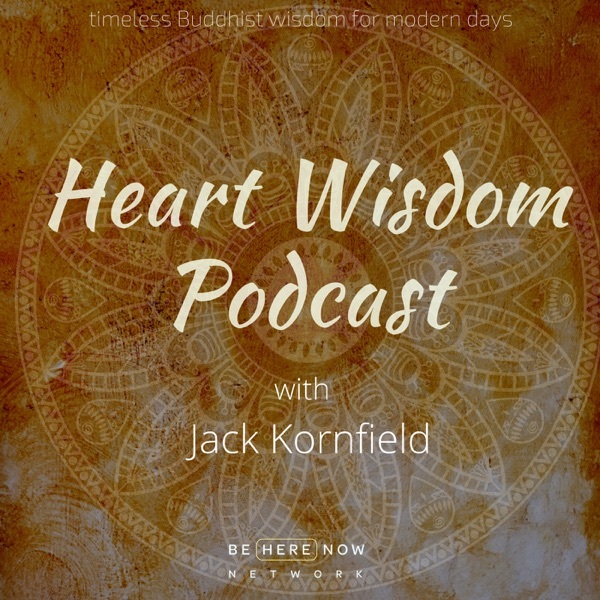 On this episode of the Heart Wisdom podcast, Jack shares the surprising delights of renunciation. It may be difficult to equate happiness and renunciation. This week, Jack helps us realize the surprising delights of renunciation, and where in our life we can already find this happiness. This week on Heart Wisdom, Jack discusses the joy of virtue. Virtue is one of the many qualities essential to the awakening of one's true nature. Jack breaks virtue down to its most fundamental levels and shares the joy of virtue and living a life of integrity. This week, Jack speaks about renewal and seeing anew. By shifting our perspective on our own experience, we can better understand the world around us. Jack shows the importance of becoming the witness and seeing anew. On this episode of Heart Wisdom, Jack explores what it means to take the seat of awakening. Jack tells the story of the Buddha's literal and figurative seat of awakening. The seat of awakening is the place from which our spiritual path begins. Jack prepares for the trials and temptations along the path and offers a look at the rewards that await us. Jack sits down with Raghu Markus and Duncan Trussell to talk about finding gifts in suffering that transform how we interact with the world. This podcast was recorded at the 2016 Open Your Heart in Paradise Retreat, where the theme was finding the beloved and touching the compassionate heart. Jack, Raghu, and Duncan share stories and perspective on searching for love in dark times. They remind us that out of our deepest wounds and insecurities are born our greatest gifts. On this episode, Jack speaks about the different aspects of inspired leadership and how to cultivate them in our lives. Jack explores the natural perfections of the heart and how to listen to the leader inside you. We also hear three stories of inspired leadership expressed through dedication, love, and equanimity. Jack delivers a talk on how identity leads us to suffer and shares the Buddha's path towards freedom from that suffering. The Buddha's teachings are a path to end suffering. Part of this is our identity, which is caused by our clinging to impermanence. Jack shares these teachings, along with an ethical system which enables us to let go of our suffering by living with integrity. On this episode of Heart Wisdom, Jack talks about leadership, nobility, and love. American presidents George Washington and Lincoln are used as examples of men who showed true nobility of heart. There is a sense of justice in their words and a kind of integrity to their actions in the midst of unbearable suffering, which is a sign of real leadership. This is a quality of nobility which we can find ourselves in our own roles as leaders. The Buddha says that wise leadership requires generosity, integrity, peace, and sacrifice among many other traits. These are all qualities that can be awakened in us. This is why we are given the practices of compassion, mindfulness, and equanimity. Jack teaches us to utilize these practices in an effort to awaken our inner nobility. Jack also discusses the diversity of love and its many roles. Love brings happiness, heals, and even teaches through loss. We explore a few ways in which love can present itself and affect our lives. Jack’s timeless wisdom leads the way as he responds to a handful of questions concerning some of the common struggles encountered on the human plane. How can we be present with difficult situations without indulging the emotions? The problem often lies more in the narratives we tell about ourselves and others that perpetuate the suffering. We must be willing to allow the energies of life to rise and fall as they do, all the while expanding our capacity to feel without necessarily believing the storyline, which is often biased and untrue to begin with. In learning to be with our emotions we are better able to respond from a place of wisdom rather than an expectation of how it should be. Taking time to recognize the distinction between wise and unskillful desire is a practical and effective method for addressing the root causes for much of our suffering. Through examining our impulses, we gain the perspective necessary to determine if the associated actions will ultimately increase our joy or our sorrow. Jack reminds us that we don’t need to get rid of anything, we just have to remember who we really are and operate from that deeper self. The seeds we plant in the garden of the heart are not separate from us in their origin or their blossoming. Jack offers tales of tenderness that remind us of the qualities of faith and compassion which move us in the direction of freedom. What resources can we bring to a world of conflict that might allow us to live in the reality of the present with an openness and trust that what needs to be healed will be done through love? In coming to rest in the space of calm and kind attention that grows in meditation, we learn to listen with the heart and move with the inspired energy that follows. To create and maintain appropriate boundaries we must first understand what it is as we are approaching attachment, commitment and love. Jack offers a definition and reinterpretation of attachment to represent more compassionate qualities such as commitment, dedication and wise ambition. He encourages us to be present without the need to control, to show up but not be focused on the outcome. We learn to step back and listen to the world as a means of witnessing the play of life. Our opening will present itself, but only when our perspective is wide enough to discover the full range of potential. Jack offers up several stories to emphasize the ways in which mindfulness consistently returns us to a radical capacity for presence that can truly change our lives for the better. The natural freedom revealed through the quality of compassionate awareness is itself an act of respect. The understanding and integration of right livelihood lays the groundwork for gratitude in ourselves, and serves to inspire others who encounter its compelling energy. There are many ways to approach the work we are given, but through honoring our tasks we can bring to them a spirit of dignity, care, and beauty. A succinct reminder of the ever-present possibility to step out from the blinders of our ordinary perception, from the fear and anxiety of modern life, and to instead see with eyes of understanding. Through practice we begin to fully grok the necessity for and value of forgiveness, learning to let go of the expectations that inevitably compromise our capacity for compassion. Beginner’s mind is highlighted as an anchor point for helping us return to the openness, eagerness, and lack of preconception that embody our true nature. Drawing from Buddhist text, Jack tells the story of the last year of Buddha’s life, and the teachings he imparted to his followers and future seekers on the path. Guidance for practice, and instructions for building and sustaining wise relationships were the focus of these final offerings. The power of mythology is emphasized in appreciating its capacity to speak to the human imagination. When removed from the lens of literality, these stories are brought to life, imbuing the narrative with a depth and timeless relatability from which we can continually find inspiration. An exploration of the ways in which the quiet mind and open heart lead to wisdom, depth, and love. Our practice itself is an act of Love that gives us the ability to be present for all of humanity. Our growing capacity to feel our joys and sorrows allows us to live more freely in the energies of our life. Jack sits down with fellow podcast patrons, Duncan Trussell and Dustin Marshall, for an in-depth discussion about navigating some of the darkest corners of the emotional spectrum. We are encouraged to open to Love, despite the innate vulnerability and collective insecurities that inevitably arise. In cultivating the Witness, we are able to step outside the drama of our lives, creating just enough space to approach our suffering without getting lost in it. A wonderful exploration of our inherent worthiness regarding our capacity for Love, and the small steps we can take toward the healing our hearts and minds in the most hopeless of moments. A gentle reminder that the possibility of awakening exists in every moment, and in every circumstance. Liberation comes not through suppression or by fighting against ourselves, but rather by resting where we are, at peace with the world as it is. We can all sense the potential for bringing compassion to ourselves and the world around us, and need only be reminded through the power of practice. In embracing our humanity, we move into the pure awareness of our own true nature, learning to live wisely and discovering freedom and compassion regardless of circumstance. The path is not about attainment, but rather an opportunity to recognize the patterns of life and begin to align ourselves with its flow. Jack shares the ways in which we can live with a wise heart in the midst of impermanence, with ease amidst the dance of life. Jack weaves a tender web of allegorical expression regarding our natural call toward compassionate action. We learn to not seek satisfaction in the results, but in the value, rightness and truth of the work itself. We can’t bring the rain, but we can offer to plant the seeds of our heart’s best intentions. A spacious meditation closes the talk, in which we are invited to uncover our own unique Bodhisattva vow. In practice there is an invitation to shift from the real-time experiences to the spacious and open heart of wisdom, ease, and graciousness. Through dedication to our practice we begin to find the trust necessary to remain present no matter the circumstance. As this presence grows, the factors of enlightenment such as mindfulness, joy, and equanimity slowly emerge. The awakened mind and heart are awaiting you, asking only that you make the effort to acknowledge their presence. In meditation and in our spiritual life there grows a kind of trust in our capacity to open, to change, and to transform no matter the circumstances we face. The shift of identity comes in recognizing that the smaller sense of self is not who we really are. The original nature of the mind is pure knowing, and through this understanding we begin to find the joy of the liberated heart. Jack continues his discourse on the nature of the freedom that is our true being. It does not arrive through the rearranging of circumstance or the discipline of self-improvement, but in the acknowledgment and allowing of all of life’s movements. The aim is not passive acceptance, but rather a relaxation that fuels the energy to respond as necessary. In knowing when to hold on and when to let go, we embody the gracious and honorable presence that characterizes our deeper self. Freedom is not found in certainty, but in the wisdom that comes from seeing and embracing life as it is. Jack explores the different ways that freedom can be embodied and fully represented through the nobility of Spirit that is born into every being. When we uncover this freedom, to be who we are, to serve others, and to care for the world, we discover that it was our purpose all along. “When Love meets sorrow it becomes compassion” As we become silent we start to awaken to the mystery of this human realm. We begin to open to and acknowledge all of the unfinished business that often permeates our being. Through practice we can learn to offer love in the presence of pain. In these moments of loving-kindness we feel a connection to the web of life and discover the more objective nature of our struggles and sorrows. As Jack explains, no matter what level you are practicing on, you cannot fully open without compassion. “What we’re looking for is where we are” - Dharma speaks to the ways in which we choose to navigate the uncertainty of our time on this planet. Can we learn to live in joy amongst all that this great unknowing has to offer? Jack guides us through some of the key principles of the awakened heart, encouraging an attitude of graciousness toward the mysterious nature of our existence. A spacious walk through the shifts of identity that often occur as we move from the smaller sense of self into that place of loving awareness, the ‘one who knows’. This opening can be understood as the entrance point to Awakening. Though it may be unfamiliar and often times uncomfortable, it is ultimately necessary for moving beyond the limitations of the separate self. Jack provides us with a map for this new territory, and reassures us that the intelligence of the heart will lead the way, even through the darkest corridors. Spiritual practice requires of us a kind and devoted attention to the opening of the body as well as the heart. We cultivate the necessary space through a quieting of the mind, and invite a sense of compassion and openness into the heart. We can then listen to better understand how to become ourselves what we want the world to be. There is a profound offering in our commitment and dedication to becoming the most beautiful human beings that we can be. At the root of this offering is the desire to allow spiritual practice to be the tool with which we tend to the garden of the heart. What attitude can we carry into a world of conflict and difficulty that will allow us to treasure and fully embody the work we do in practice? In this talk, Jack details the teachings of the Bodhisattva - a commitment to the welfare and awakening of all beings. We are encouraged to find our deepest intention, the most beautiful thing we could do with our life, and to let that be our reference as we move out into the world. Through ‘deep knowing and deep intention’, we begin to embrace a sense of the sacred in everything we do. The spiritual path seems as much a journey of becoming who we are, rather than attaining some elevated sense of self. But what circumstances must arise in order for us to honor our particular incarnation, and to then do something beautiful with it? Crisis, trauma, and retreat are just a few of the potential catalysts, and our task is to simply recognize and accept that which has served to encourage our own efforts along the path. We begin to see that it is often just a matter of remembering and reminding ourselves of the different ways that we are brought to freedom and joy in our own lives. The heart needs poetry much like the Earth needs rain. It is the music, the harmony, and the bearer of truth throughout our life’s journey. To uncover our poetic sensibility is to begin to find the rhythm of language that matches the beauty of the world around us. Our experience of life is described as a river that we embody, that we are a part of, rather than simply living in. Awareness is ever-present, as we learn to become mindful of our experiences without becoming lost in them. Our state of mind determines our relationship to the world around us. Our practice therefore becomes one of quieting the mind, opening the heart, and being present in order to touch all that arises with the spirit of compassion. Ancient Buddhist tales of redemption are recounted to encourage our understanding that it is never to late to start anew. The object of meditation is to sit in the midst of this mysterious human incarnation and to hold it with mercy and compassion. We then discover that wisdom and training have the power to trump our temperament. Jack sits down with our podcast guru, Duncan Trussell for part two of their conversation. Our fundamental wakefulness can be described by certain qualities of enlightenment that speak to our inherent nobility. It is in the remembering of these factors that we can taste the freedom of reconnecting with the openness and luminosity of mind that is our true nature. Mindfulness is the seed from which all other qualities can grow. We all carry questions about our lives and how we might find relief from the struggles we encounter throughout our mysterious incarnations. Who are we and how can we come to understand what it truly means to embody our deeper self? The original nature of consciousness itself is luminous, and free. In awakening the heart we uncover this inherently pure awareness. The spirit of simplicity, presence and sympathy of heart can carry us through the most difficult and beautiful of times. When we learn to make peace with the way life is, with the understanding that this capacity is our own true nature, then we fully embody the heart’s deepest desire. Mudita is the joy and happiness experienced for oneself and others. This joy is born into everyone, but is not limited to the innocence afforded in childhood. It is alive in all of us, and mindfulness is the gateway. Meditation allows us to be present for ourselves, each other, and for the wonder and beauty of our mysterious incarnation. Behind all the drama of our lives, there is something unchanging and ever-present, for everyone to discover. Our methods and practices point us in the direction of this awakening, as we move from reaction to compassion. Nothing left out, and no one to blame, perfecting only our loving awareness of it all. The vastness of the human heart is as timeless as it is profound. No matter the circumstance, we can choose to remain openhearted, knowing that the possibility of freedom is available to everyone. Wisdom is eternally gracious; it sees the world as it is, vast and ever changing. It allows us to become ourselves, to awaken to the actual experience of existence, without getting caught in it. We eventually recognize our shared experience, and a natural sense of respect arises. When we look through the eyes of wisdom, we dissolve separation, and move into the compassionate state of loving awareness. ‘The true joy of life is to plant trees, under whose shade you do not expect to sit’. Consciousness itself is the witness to our lives, and we are born with it, in its purest form. It knows that what we often identify with is not who we truly are. The practices of compassion, mindfulness and loving awareness invite a profound shift of identity, from the body of fear to the beauty of the heart. Jack is joined by actress and comedian, Natasha Leggero, for an enlightening conversation about maintaining composure in seemingly chaotic times. Jack explains that our outer progress must be matched with an inner change in human consciousness; a process that evolves through the recognition of our interconnectedness. The two also touch on fundamentalism, evidence for hope, and the importance of routine ritualistic practice in unlocking the deeper dimensions of our being. Jack discusses the fundamental mystery that is our human incarnation, and the methods we can utilize to stay close to that immense presence. Meditation isn’t necessarily about having a mystical experience, but about coming back into the natural mysterious experience of being alive. Within all of us there is a divine seed of consciousness, much greater than the functional matter that we occupy. In meditation, we are invited to return to this sacred space. One of the most important tools for navigating through our complicated existence is the understanding of Karma. We consistently create patterns in our lives but often fail to see the cause and effect relationship that unfolds. Karma speaks to the way in which we respond to that which comes to us, to the life that we are given. It’s not the action but the intention that is the source of karma. Through meditation we expose the patterns that we create for ourselves. By tending to our hearts we discover a deeper motivation for our being. It is from this place that we learn to plant our seeds of intention, and the seeds we plant become how are lives are lived. Jack sits down with comedians Pete Holmes and Duncan Trussell to discuss a variety of topics including the amorphous construct of our identities, dreams and death, mystical experiences, and the interaction of spirituality with materialism. Jack also describes the illusory nature of perceived security, and the freedom that can come when we discover the art of truly awakening to our mysterious incarnation. In this talk, Jack Kornfield discusses how to navigate change in relation to the Buddhist concept of impermanence. He touches on the importance of meditation in cultivating a healthier perspective toward change. When we are quiet, we can rest in loving awareness and see our true nature from the heart of understanding. When we accept that change is inevitable, and find our composure in that knowledge, we can reenter the river of experience.